Haywards Heath Town entertained Bostik South East league leaders Cray Wanderers and went toe to toe for 89 minutes before Ben Mundele scored with just a minute remaining. In a tight first half chances were limited with Cray dominant in possession but Heath more than matching them throughout the pitch and Heath keeper Josh Heyburn making just one good save low down to his left in the 11th minute. Both sides picked up yellow cards with Callum Saunders going in the book for Heath, in the 24th minute Heath were denied when the Cray keeper Nick Blue couldn't hold onto the ball at the edge of the box but he made amends with an out-stretched leg to deny Callum Saunders a certain goal. The rest of the action failed to test the keepers with Cray hitting the side netting and Alex Laing cutting in but the effort wasn't difficult for the keeper. Both defences continued on top putting in some fine blocks and protecting the goal. After the break the match could have gone either way, the visitors started well and saw a fine effort just clear the bar after the Wanderers man cut in from the left and sent a fierce strike over. 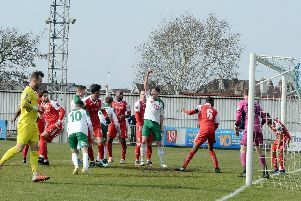 Heath had to reshuffle when Callum Saunders was sent off on 65 minutes for a second bookable offence must to the frustration of the home support. Heath looked to contain their visitors and play on the counter with Heath’s Alex Laing firering just over and then Heath's bigest chance came as the impressive Kieran Rowe advanced and crossing that Andrew Dalhouse got to by way of a diving header but the marking defender got just enough on the effort to divert it for a corner. Max Miller replaced Andrew Dalhouse shortly after with Alex Laing moving into a more advanced role. Cray should have really opened the scoring on 77 minutes but as the first effort was well blocked the loose ball fell invitingly to the Cray Striker but he blasted over from around 8 yards out. Cray continued to ramp up the pressure and only another fine stop from Josh Heyburn kept the scores level on 78 minutes. Heath now playing on the counter attack saw Karly Akehurst well placed but he dragged his effort wide, with time running out Alex Laing went closest to winning the game for Heath as his effort from 20 yards crashed off the crossbar and out but despite the keeper getting a touch a goal kick was given. It would be all three points for the unbeaten side however as in the final minute Ben Mundele found some space inside the Heath box and rifled the ball into the far corner, Heath could felt hard done by as Josh Spinks seemed to be fouled in the build up but the referee waved away any protests and Cray claimed the points.